Glenn McGrath Oval is a ground like so many others around Australia: picturesque and inviting — complete with the picket fence — where the only thing that matters is the game. A world away from those who scrutinise every ball. A world where young boys and girls dream of, one day, playing for their country. Steve Smith is one of the privileged few to live that out dream — going from a suburban oval dreamer to world stage dominator in a handful of years. A prodigious talent, his well-documented progression from grade cricket boy-wonder to international superstar was swift and spectacular. So too was his downfall. Now, for Smith, it starts over. His dream of once again playing cricket for his country has taken him back to where it started — playing for Sutherland at Glenn McGrath Oval [formerly Caringbah Oval]. “Hopefully I can teach some of the young guys the game, or help them learn the game,” Smith said in a video released by the Australian Cricketers’ Association on the eve of the match. 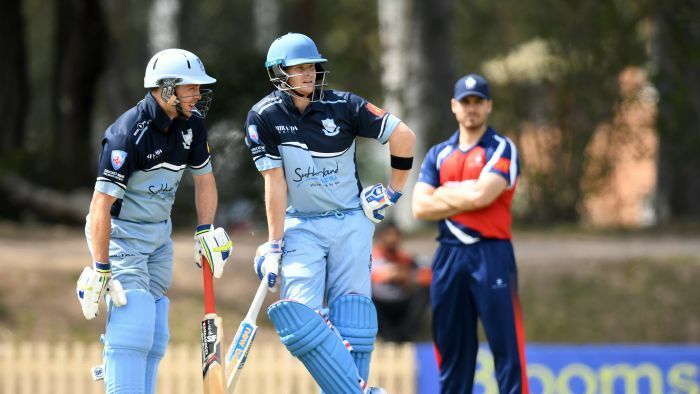 It’s the beginning of the 2018-2019 NSW Premier Cricket season, and already there’s a buzz in ‘The Shire’, in Sydney’s south. Smith is back playing for the Sharks, albeit in circumstances that no one could’ve predicted. “It’s unbelievable,” said Stuart Clark, who played for Sutherland and went on to represent Australia. “To have him around the club, to have him playing cricket again … I know everyone — the club and the opposition — is excited. His Baggy Green has been replaced by his Sutherland District sky blue-coloured cap. It’s nearly four years since he last played for the club; almost five since his last outing at Glenn McGrath Oval. “From what I remember it was a pretty good wicket and a lightning fast outfield, so it’d be nice to get out in the middle and score a few,” Smith said. He wouldn’t have to wait too long. After Mosman won the toss and sent Sutherland in to bat, Smith came to the crease within the first hour of play. As he strode out to the middle, the reception he received from those in attendance quickly went from raucous to silent. If Smith was nervous about facing his first ball, so too were the few hundred who’d gathered to watch him play. He got off the mark immediately, much to the delight on the supporters and the man himself. In no time the Smith of old — the batsman who’d dominated some of the world’s best bowlers — was on display: the fidgeting at the crease, the idiosyncratic movements, the loud calls and, of course, the slashing — but unorthodox — drive through the covers for four. Smith was dropped on 11 — it would prove costly. A clip over deep backward square for six and Smith was in. As news spread locally that Smith was batting, the few hundred crowd soon trebled. His fifty came up off just 62 balls before he fell for an entertaining 85. Almost as impressive were the numbers generated by the canteen: nearly 600 sausages and 200 steak sandwiches sold to those who came to watch. “He batted nicely — you could see he was very much in the zone”, said injured Sutherland teammate and former Australian all-rounder, Shane Watson. “He was always going to come out and do well. In 2005, at just 16-years-old, Smith made his first-grade debut for Sutherland. His exceptional skills saw him swiftly progress from grade to state and onto the pinnacle — national honours. In 2010 he made his debut for Australia. Smith would go on to become the 45th captain of Australia and establish himself as one of the sport’s best batsmen. At the peak of his game, Smith played his part in the infamous ball-tampering saga in South Africa in March. It led to a year-long ban from domestic and international cricket. Smith’s 12-months in cricketing exile equates to almost 50 internationals he won’t play for his country. Now Smith is poised to make yet another seismic impression on the NSW Premier competition. It’s also a chance for the 29-year-old to rebuild his standing in the game and rebuild his reputation. This is his first game back on home soil since the ban. At this stage he will play out the remainder of the Sydney grade season with his boyhood club. “It’s great for the club — it’s great for our community — you can see the number of people that are here, they’re all locals and it’s great to be a part of it,” said Sutherland president Matt Duff. “They’ve grown to love him as a player and as a captain and they really want him to get back to international cricket, where he belongs, and this is just part of that process. Fortunately for the fallen skipper, grade cricket is a world away from the international stage. It’s less of a job and more of a passion — no one at the Sharks gets paid to play. And it’s an ideal environment for a young man desperate to resurrect his career.